It’s generally well known that Shipley Do-Nuts’ breakfast catering is the perfect choice for many special occasions and events. People choose us time and again for these primary reasons. Fresh quality product, affordability, on-time delivery, and a convenient easy online ordering experience — not to mention, our friendly and reliable customer service. Most important to us, however, is that we want your event to be an indisputable success for you and your organization. This is why we’ve put together a list of things to remember for your next Houston breakfast catering event. The first reason that you may want to choose Shipley’s for breakfast catering in Houston is our affordable catering packages. Our full catering menus have everything that you will need for your special event or team meeting. In addition to our standard variety of donuts and kolaches, our catering menu includes party pans of donut holes & kolache poppers, fresh cut fruit, and 1 & 3 gallon disposable coffee containers. Party pans are one of our most popular choices for breakfast catering Houston. Our party pans include our delicious donut holes and famous kolache poppers. Party pans are ideal for large events like reunions and corporate gathers, and smaller events like breakfast meetings small groups, clubs, and classes. They can accommodate large and medium size groups of people. Other things that you will find abundant in our Houston breakfast catering services are our fresh-cut fruits. Fresh fruits are some of the healthiest items that you can ask for when it comes to pleasing a variety of tastes. Shipley Do-Nuts breakfast catering in Houston is easy, because of our online ordering system. Got questions? Then call us at (281) 220-1103 to speak with someone who can help you. Another way that you can order catering services is by completing an online form. You can count on Shipley’s for friendly and reliable customer service when you order one of our breakfast catering packages in Houston. Breakfast catering these days is about variety. Your guests want choices. Gone are the days of one-size-fits-all solutions. Each of your guests is unique, with their own personal likes and dislikes. Having a variety of options helps ensure that there is something for everyone to rave about. You can choose among a variety of baked pastries, as well as kolaches make with or without cheese, meatless, and our ever popular grilled chicken with pepper jack cheese and a side of spicy ranch dressing. Yum! For others, the drink of choice is good old O.J. Orange juice is a staple of our breakfasts. It’s always a welcome, refreshing taste at the breakfast bar. If coffee’s not your thing, what’s better than some ice cold milk with your breakfast catering order. You can choose whole milk, 2%, or even chocolate milk. You’ll want to have some bottled water for those who won’t drink anything but water for breakfast, because they don’t want the extra calories or caffeine. Breakfast catering food, however, is always the biggest factor in providing an exceptional experience at your event. Just like with your beverages, you want to emphasize variety and options. From our assorted classic donuts to individually wrapped & labeled assorted kolaches — you can go sweet, savory, or spicy, Shipley provides Houston breakfast catering options for everyone. Plus, round out your order with a fruit tray of fresh-cut seasonal fruit to truly offer an impressive spread. To give your order the extra bit of wow, don’t forget about our exclusive ‘Business Builder Program.’ This corporate catering program allows businesses to put their own branding on our boxes. A great reminder of who is hosting the fantastic event. Of course, no talk about Houston breakfast catering would be complete without a quick mention about the venue. As we all know, a venue can literally make or break your event. Reliable, dependable services are a must. Plus, don’t forget a place for people to eat their fantastic breakfast fare. If your event doesn’t have tables, then adding a few high, cocktail tables near the food will do. People will naturally go to the tables to eat, then usually walk away when they’re done, so you don’t need a place for everyone. If your event does have tables, then a few waste cans and napkin stands are also a must. With breakfast catering from Shipley, cleanup is a breeze. Last but not least, be sure to choose a caterer with lots of Houston breakfast catering experience. This will create a worry-free situation for you, your team, and your guests. Whether you are looking for donuts for a wedding, corporate event or a quick donut and coffee on your way to work, you can trust Houston’s best. You can conveniently order donuts online, or experience a more personal touch by calling our catering & delivery coordinator, Steve Grooms, at (281) 220-1103. 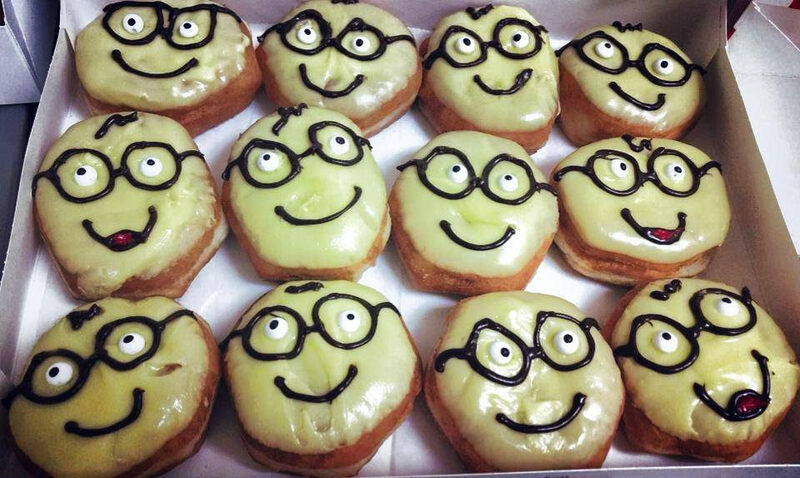 Remember to check out the beautiful donut gallery found on our website by clicking here. is 25 mg of tadalafil too much [url=http://cialisles.com/]http://cialisles.com/[/url] cialis porta dipendenza.